ปรากฎว่า Google เมื่อวานใครใช้ gmail คงได้เฮเพราะ Google ได้เสนอ Plan ใหม่โดยการลดราคาจาก $75 เป็น $50 เพราะเพิ่มพื้นที่ จาก 40G เป็น 200G เย้ !! เหมือน HDD Online เลย 😀 นึกถึงสมัยก่อนผมทำงานบริษัทญี่ปุ่นเค้าให้ใช้ Lotus note และกำหนดโควต้าเมล์คนละ 50M ตอนนั้นอยู่ได้ไงเนี่ย ? 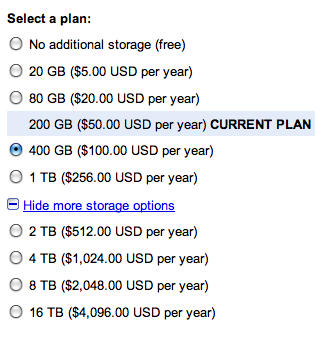 We wanted to let you know about some exciting changes to your Google paid storage plan. While storage costs have dropped naturally in the past few years, we’ve also been working hard to improve our infrastructure to reduce your costs even further. On Tuesday, November 10th, we increased the size of each of our tiers to make storage even more affordable and accessible. We’ve replaced your $75 plan with one that only costs $50, and instead of 40 GB you’ll get 200 GB, 5 times as much storage. Your current plan will be automatically upgraded and your new quota will automatically show up in your account in the next 24 hours. We hope you?ll like the extra space, but if it?s more than you need you can always change your storage plan or renewal preferences for next year in your Google account settings: www.google.com/accounts/purchasestorage. Feel free to visit our Help Center for more information. ?2009 Google 1600 Amphitheatre Parkway, Mountain View, CA 94043. You have received this mandatory email service announcement to update you about important changes to your Google paid storage account.